A new report in Synthetic Monitoring - Step analysis provides a comparison of the current day&apos;s response time to the average response time of last 7, 14, 21 and 28 days. The table data in "Test Execution Report" can be downloaded in PDF and Excel formats. Not just that you can also sort on Column visibility. 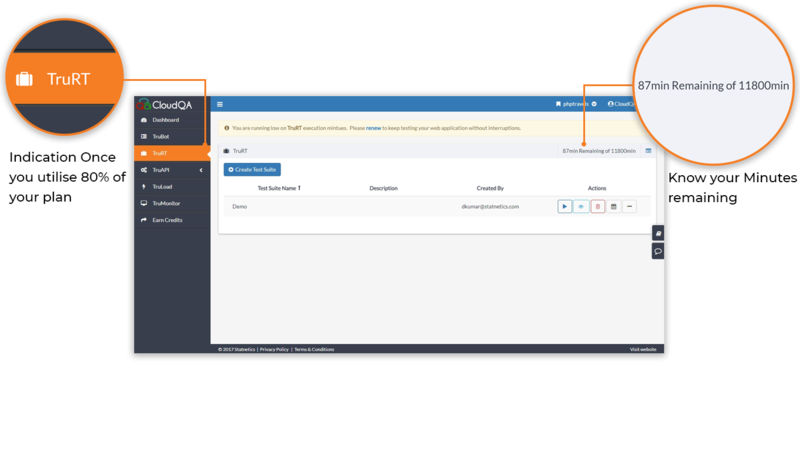 CloudQA has now enhanced file upload feature if you want to test multi-file upload scenario in your application just record the test case and in edit steps upload multiple files using the "ctrl" button. Fixed toggle URL switch in synthetic monitoring execution history. We have done improvements to the Resource Timing graph in the detailed result page. 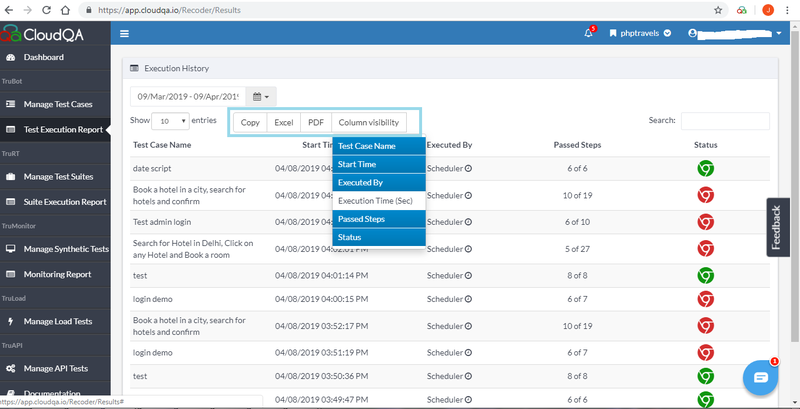 Instead of going back to edit steps page (or) manage test cases page, you can directly execute your test case from the results page. You don&apos;t have to wait for results of load tests to show up! we are showing a live graph while the load test running. 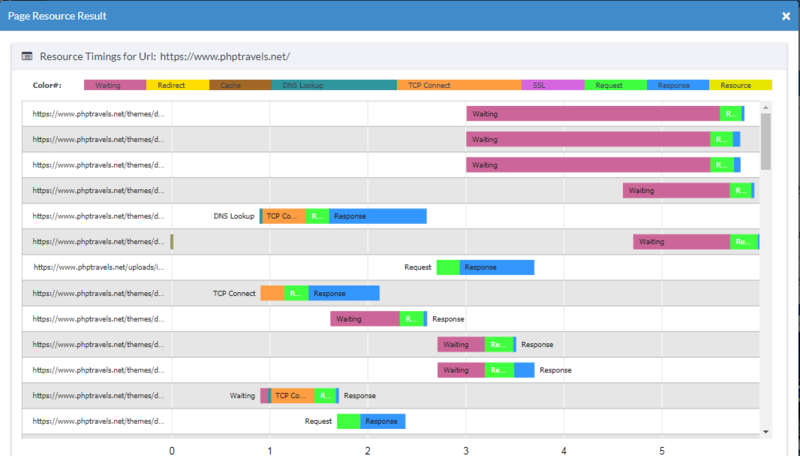 The new graph in detailed result page which allows you to analyse the performance timings of all the URL&apos;s.
Great news! A new download option in Monitoring report page which allows exporting the table data in different formats. Fixed download recording results summary report issue. We have made a small-but-nifty improvement to the results page: For a step - script CloudQA can capture Page Load Time, Resource timings and the URL clicked by the script in the detailed result page. This allows users to debug easily if there is a failure in the test case. 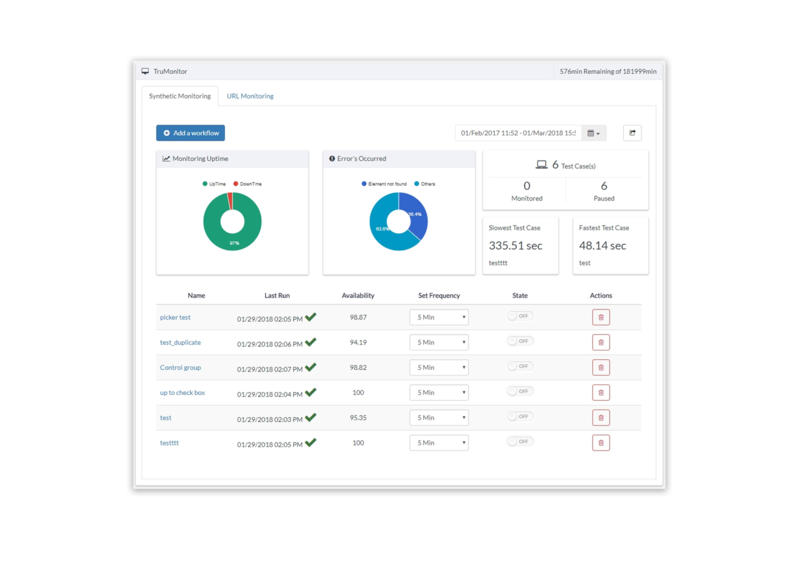 Enhanced TruRT Dashboard: The new dashboard is not just a fresh design but also gives an overview on Test Suites scheduled and total amount of test cases per suite. 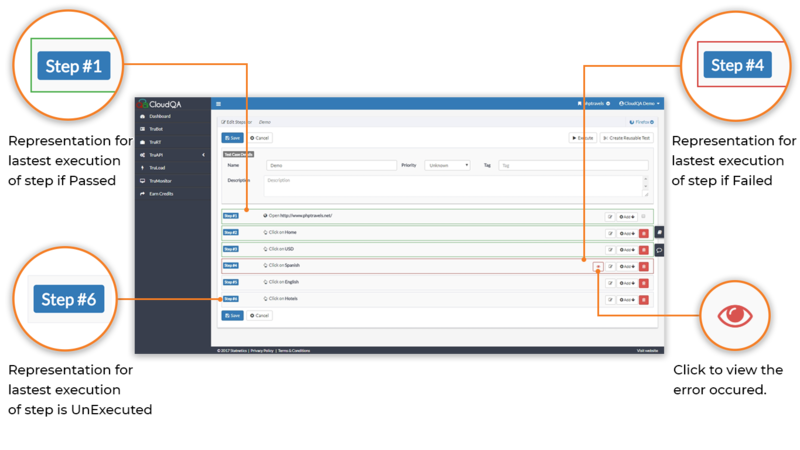 You can drill down and inspect a specific "test suite" run and see the results of each test case. 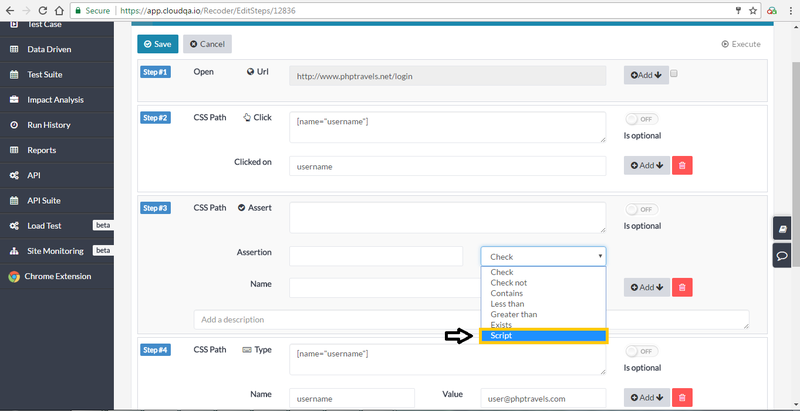 API Parameterization: Not just at test suite level and test case level, now variables declared at the application level can be used inside API tests. Fixed Chrome Extension Installation issue. New Regression Test Reports: As promised to improve our Test Suite reports, there&apos;s a new, cleaner design of the reports. Live customer support team: We have introduced a chat in CloudQA application to resolve your issues on demand. Guiding user right! : As per inputs from many of you, we have implemented a new status code for a test case if any of the optional steps fail in a test case. Other than pass/fail now test case can be partially passed. 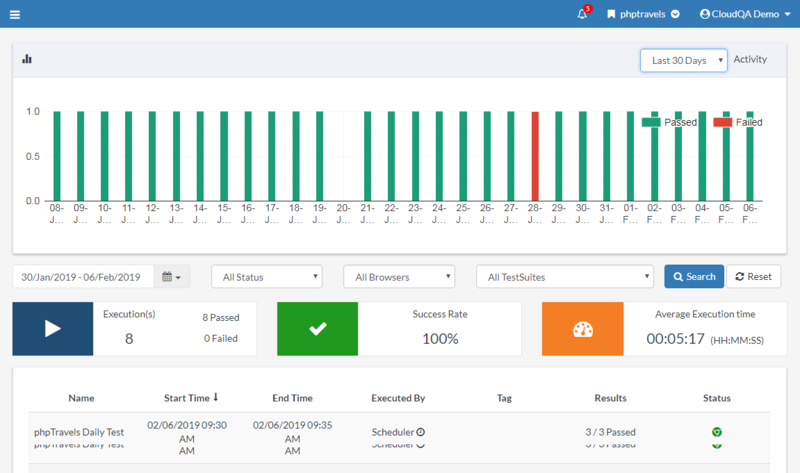 Improved Availability analysis report: Not just showing the errors, a user can access the errored tests directly from availability analysis report page. You&apos;ve been asking and now they&apos;re here: Real-Time Synthetic Monitoring reports, navigate to Monitoring Report to check the below reports. 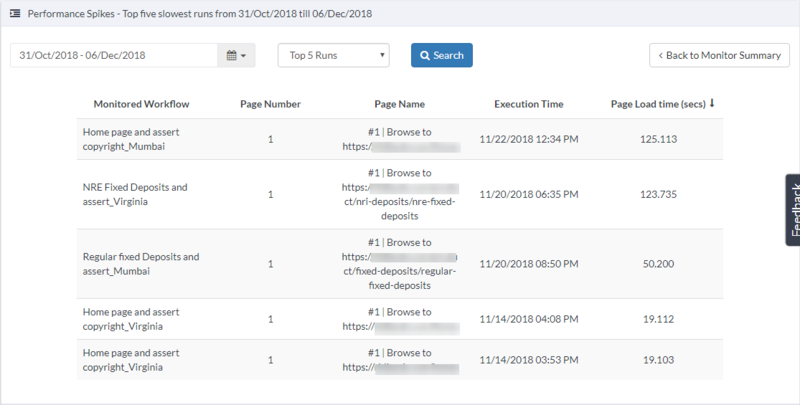 Threshold Spikes: Allows you to identify the underperforming workflows at the page level and you can drill down to individual page executions. Performance Spikes: You can identify top slowest runs across your workflows at a page level. SLA report: Helps you understand workflow performance metrics across time. 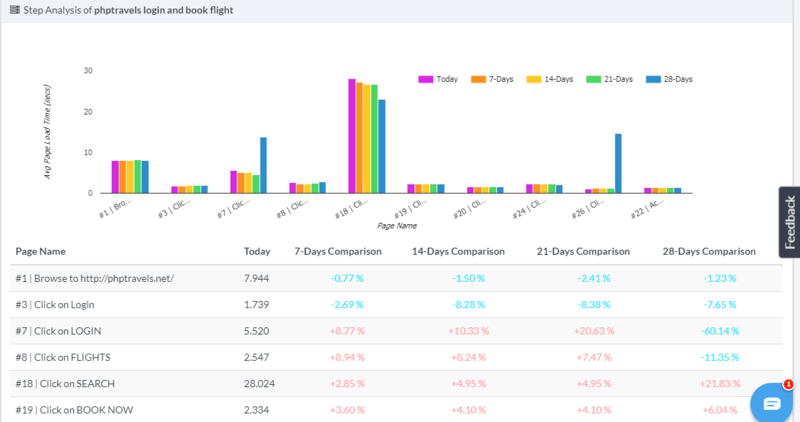 You can compare your current performance to historical metrics with daily, weekly, and monthly reports. We always strive to add value, rolled our baseline performance graph at step level. 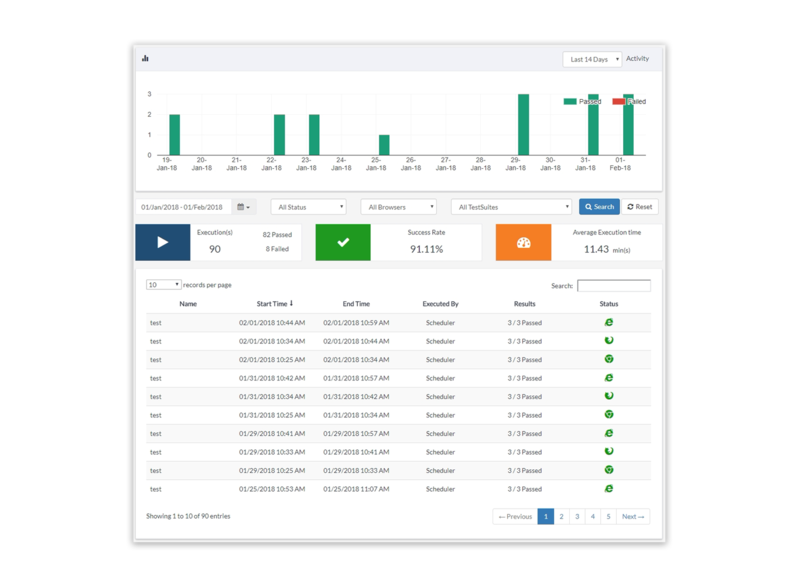 Now real-time performance metrics can be tracked outlining high and low performance of your application. Now you can also verify that an element does not exist on the page. implemented the element doesn&apos;t exist assertion. As part of improving your onboarding experience, we updated gif&apos;s for easy understanding and made the onboarding process simpler for new users. We&apos;ve rolled out updated side navigation menu in CloudQA application with a new, cleaner design. You can access results directly from the menu, they&apos;re just nicer to use and easy access! 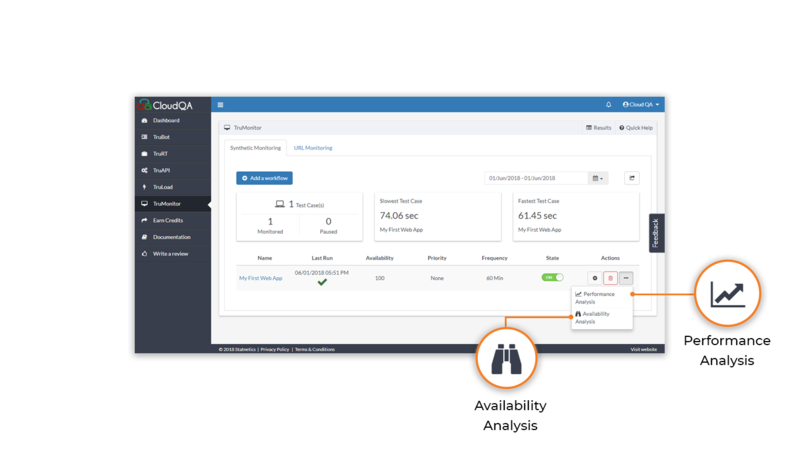 CloudQA always looks to add more value to the customer and here we are with new synthetic monitoring reports which will help the user to check the performance metrics, benchmark graphs and KPI trends. You ask we listen! 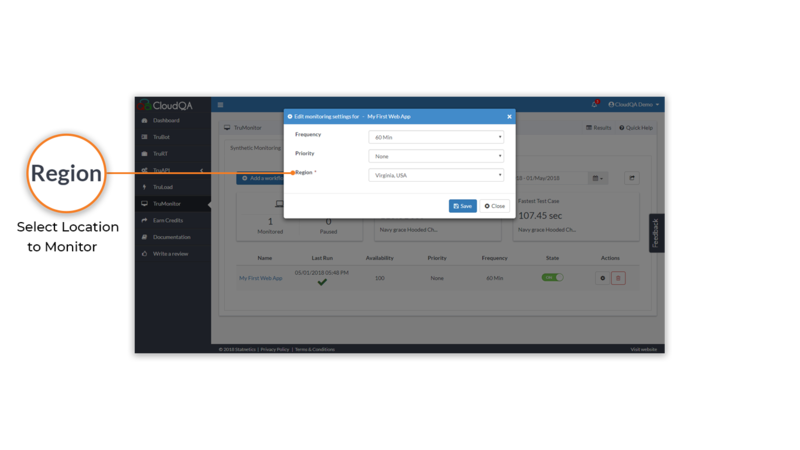 Now CloudQA captures performance metrics of Single Page Applications (SPA) as well. Get actionable performance insights and ensure optimal user experience on your single-page apps. Fixed email notification issue in TruMonitor. The issue with TruMonitor availability and performance analysis is fixed. 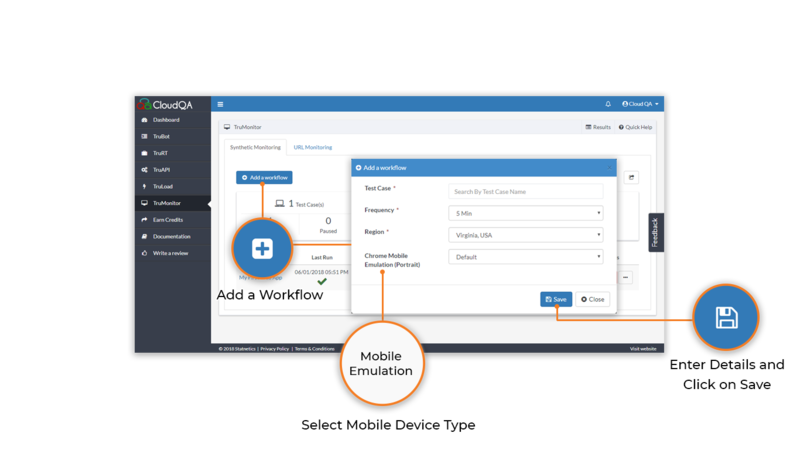 An updated version of CloudQA&apos;s execution engine is available now. We have made major improvements to Application performance. We have simplified the user interface of Notifications and Integrations. Now it is more intuitive. Fixed performance timings issue for single page applications. Fixed issue with TruMonitor email link. Now you can know the number of SMS&apos;s consumed in a subscription by just navigating to the accounts page. Implemented option to download TruMonitor failed cases report. Test Suite web API can be now tested with different base URL&apos;s.
Fixed duplicate slack notifications issue in Trumonitor. Fixed issue with the email ID field when user a joins from user management email invite. Great news! 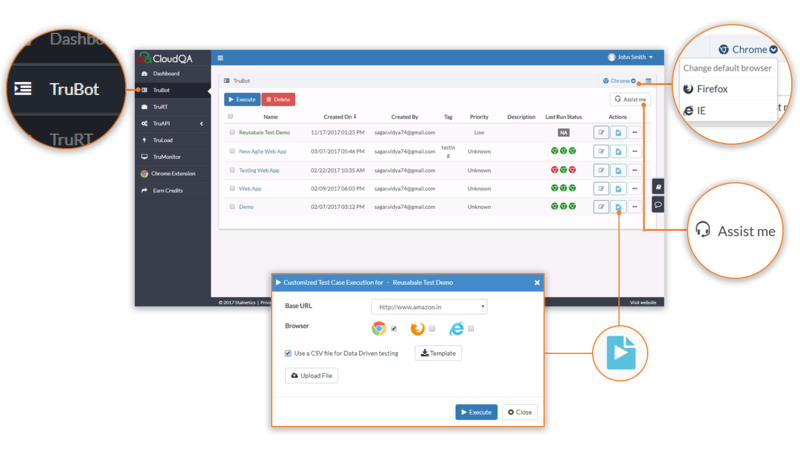 CloudQA now integrates with Opsgenie, click here to know more.. 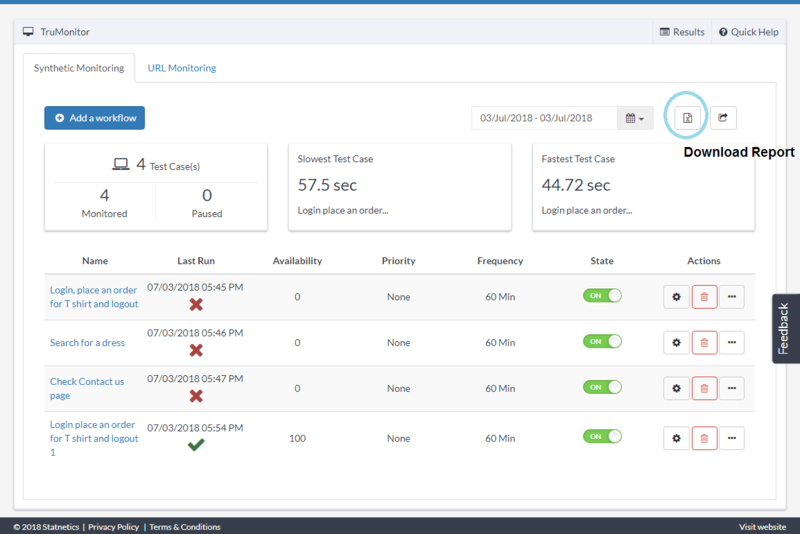 Implemented Performance and Availability analysis in TruMonitor, which helps better tracking of your application errors. Collaborated API and API Suite into single menu. Corrected few execution error messages in CloudQA - now they are more precise and comprehensible. 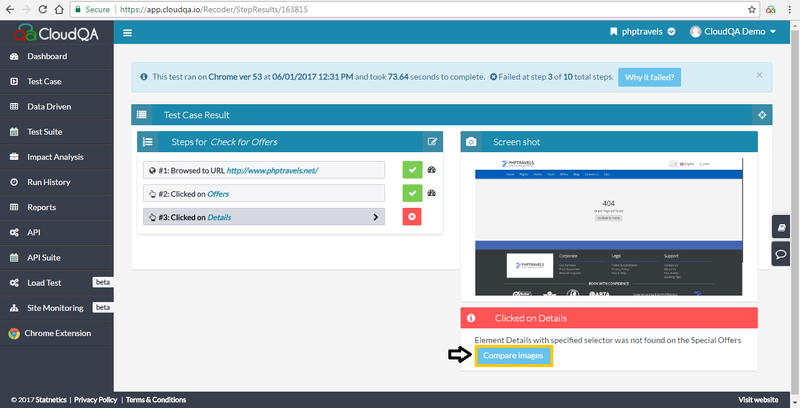 Mirror mobile devices - Record and execute regression tests using Chrome mobile emulator. You can choose from a list of mobile devices for testing. See performance metric of your application directly in results. Data Driven test error messages are imporved. Now you can monitor test cases with different locations. Fixed the CloudQA extension issue, where radiobutton and checkbox actions were not recorded properly. UI issue in TruMonitor is fixed. Great news! using CloudQA&apos;s free Chrome extension find CSS selectors. Get rid of the hassles in finding selectors using HTML. Implemented Drag and Drop of steps. You can rearrage change the step position in the test case. 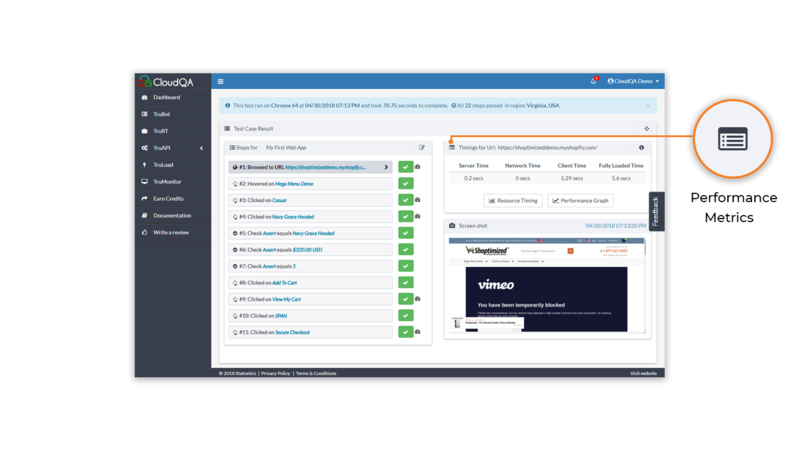 Implemented TruMonitor in CloudQA - A cloud based synthetic site monitoring tool for your web applications that monitors application performance and availability anytime from around the world. 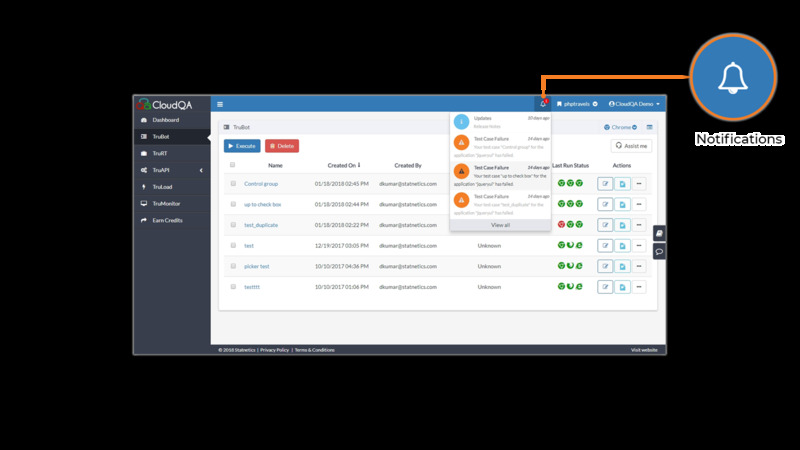 Updated CloudQA application look and feel! !